Almost 30 per cent of Australian consumers are using ad blocking technology on at least one of their connected devices but only 6 per cent have installed the technology on their mobiles, a new report has found. 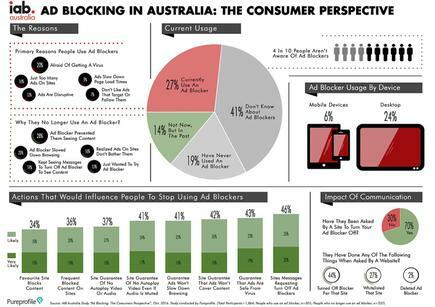 The IAB AdBlocking in Australia report, which was based on a survey of 1866 local consumers online and conducted by programmatic company, Pureprofile, reported one in five consumers are using adblocking due to a fear of viruses and malware, and 16 per cent because of the number of ads on websites. Nine per cent said they’d implemented ad blocking because ads were slowing down page load times, and 7 per cent said they don’t like ads that target or follow them. Of the 70 per cent who have been asked by a site to turn off the technology to access content, 62 per cent have either turned off or deleted their blocker, or whitelisted a site in response. According to the report, actions that best influence consumers to stop using ad blockers included site message to turn off the ad blocked (46 per cent), frequently blocked content on the site (36 per cent), a favour site blocking content (34 per cent), or guarantees from sites that ads are safe from viruses (43 per cent), will not slow browsing (41 per cent), will not autoplay videos even if audio is muted (41 per cent), or will not autoplay video or audio at all (37 per cent). The report also found 14 per cent of those who don’t use ad blockers today had used one in the past. Interestingly, the report showed that of the 27 per cent of people using ad blockers, only 6 per cent of respondents had one installed on their mobile device. IAB CEO, Vijay Solanki, said the report clearly illustrated why the industry needs to continue to evolve and improve ad experiences for consumers, and called on more organisations to draw on Lean principles (light, encrypted, ad choices support and non-invasive or non-disruptive)in order to produce light, more relevant and quality creative. “We also need to educate consumers on the safety of ad supported sites as there is clearly some confusion about advertising delivering viruses simply because many ad blocking tools are packaged with antivirus software,” he said. The IAB identify several key ways the industry could help encourage consumers to stop using ad blockers. The first was assuring them of site safety by providing guarantees that sites and ads are secure, malware and virus free and won’t slow down browsing. The second was to focus on ads that limit interruption of content flow and load quickly, while the third was polite messaging that asked consumers to turn off their ad blocker or whitelist a site in exchange for viewing content. Finally, the IAB highlighted its own Ad Block Detection Code and the need for brands to get a better understanding of how to communicate with site visitors about ad blocking. The IAB said its Adblocking Taskforce is now working on guidelines and a program around the recommendations.